Less than a week until Christmas!?! Oh my gosh. I am not even halfway there...not even a quarter way there. As always, a deep fryer works best here, but if you don’t have one, a pot filled with about 1 inch (2.5 cm) of oil will work just fine. Preheat your oven to 400°F (200°C, or gas mark 6). To make the sweet potatoes: Slice the sweet potato into thin rounds, about 1/4 inch (6 mm) thick. You can peel your potatoes if you choose, but we like ours with the skin on! Place the potatoes in a single layer on a baking sheet lined with parchment or a silicone baking mat. Bake for 20 minutes. Remove from oven and allow to cool. To make the Fennel Marmalade: While potatoes are cooking, add olive oil to a pan and heat over low heat. Add fennel, garlic, shallots, and a pinch of salt. Slowly cook until very soft and tender, and just beginning to caramelize, About 15 minutes, stirring occasionaly. Add in agave and toss to coat. Crank up the heat and cook about 5 more minutes, stirring constantly, until caramelized, sticky, and browned. Remove from heat and set aside. To make the aioli: Whisk ingredients together. Keep refrigerated until ready to use. Finish the sweet potatoes: Preheat your oil to 350°F (180°C). Place milk in a shallow dish. Add flour, cornflakes, Old Bay, and cayenne to a resealable plastic bag and shake to combine. Dip one round into the milk to coat and then add it to the bag. Repeat until you have about 5 rounds in the bag. Shake to coat the potatoes with the flour mixture. Carefully add to the coated potatoes to the hot oil and cook for about 2 to 3 minutes, flipping half way through, until golden and crispy. Transfer to a plate lined with paper towels to absorb excess oil. Repeat until all potatoes are fried. Assemble the Po’ Boys: Spread a layer of aioli on each half of the french roll. Pile 1/4 of the sweet potatoes on the bottom half of the roll, and top with 1/4 of the Fennel Marmalade, add a heaping pile of the Sweet Peppercorn Coleslaw, if using. Serve immediately. 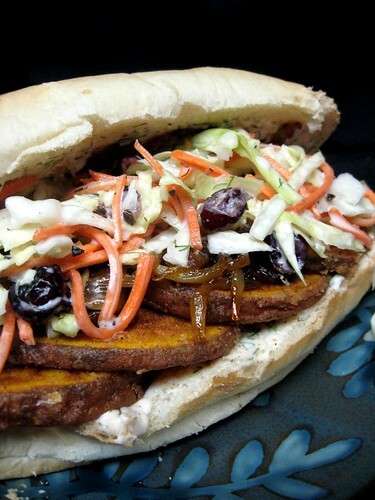 This coleslaw is a great side dish on it’s own, but it really takes the Sweet Potato Po’ Boys to a whole new level. You can make this ahead of time, but if you do, keep the dressing separate and toss together just before serving. To make the slaw: Toss together the ingredients in a large mixing bowl. To make the dressing: Add soymilk to a small mixing bowl. Stir in lemon juice and allow to sit for a few minutes. It will curdle and become like buttermilk. Toss dressing with the slaw and serve immediately. I like my sweet potatoes simply baked in a 400* oven for an hour. They come out sweet and flavorful! Thank you for the giveaway! I made a pasta tossed with tiny cubes of sweet potatoes, pan roasted, with sage and garlic, in olive oil last night. It was divine! Other than that I love sweet potato in soup!! I love mine baked then topped with margarine and seasalt and fresh cracked black pepper...hands down my fave starchy food! Yum! The po boy looks so good! Def gonna make for my family! This recipe may be my new favorite way! It looks so awesome! I love them so many ways. Simple is sometimes best. I like to toss them with a combination of fresh herbs from the garden, garlic and olive oil and roast them in the oven until they are just slightly crunchy and golden on the outside. Oh and Fred makes a mean sweet potato and green chile hash. I am a sweet potato fry gal. Baked, fried, it doesn't matter, as long as they are DELICIOUS. Diced and roasted with coconut oil! I like my sweet potatoes simply popped in the oven and roasted whole! I love sweet potato biscuits (and baked, fried, in soup or chili, in stir fry)! Baked sweet potato fries... the best!! Yum! I like to roast mine and then eat them mashed up with black beans, corn, salsa, and tortilla chips for dippin'! Whole roasted sweet potatoes are always good. Sometimes I like to lightly pan-fry the roasted chunks with sesame oil, maple syrup, and shoyu, then sprinkle them with toasted sesame seeds. YUM. I like to make sweet potato "falafel"
I'm a total wuss when it comes to sweet potatoes...the only way I really like them is when I hide them in things like muffins or spaghetti sauce. Those po'boys do look delish though...maybe I will have to open my mind to them. I love mashed sweet potatoes with vegan butter, almond milk, salt and cinnamon. I also love baking sweet potato wedges sprinkled with cumin, cinnamon, salt, paprika, black pepper and cayenne pepper. That's one heck of a sammich! I like my sweet potatoes roasted. Plain an' simple. I love to make baked sweet potato fries that are seasoned with cinnamon, brown sugar, and curry powder. I haven't really experimented with sweet potatoes as much as I'd like. Two of my most favorite recently have been in an pasta bake with kale (from Vegan Yum Yum) and in a chipotle sweet potato bisque (from Viva Vegan!). I just discovered that roasting sweet potatoes with a bit of olive oil is fantastic. I'm reading thru the comments and, apparently, plain 'ol sweet potatoes are a favorite. I'll have to try this without the oil and see if I like sweet potatoes plain. Also, I wasn't aware there are so many varieties of sweet potatoes. I wonder which one most people are referring to? I haven't made sweet potato dishes a lot but I love it roasted! Baked sweet potatoes all the way. I like just plain ole sweet potato fries the best! I am absolutely in love with sweet potatoes roasted and smothered in a charmoula sauce. It's to die for! And my god, that sammich looks insane. Um... Actually, I've only had sweet potatoes once, and that was baked. I didn't like that very much, but oh my that po' boy! That must be my future favourite way of preparing them! Crispy sweet potato fries, dipped in a mix of ketchup, mayo and curry. Yum. Looks great! Nice unique idea. I like baked sweet potatoes, but I don't make them very often. Baked with some earth balance and some brown sugar. Yum, that looks great. Last night I had a giant sweet potato, baked and topped with black beans, green onions, and sriracha. It was delicious! Oh my! Sweet potatoes just about anyway are good, but I have never had them on a sandwich! Looks so good. I think my favorite way so far is any way it is cooked that had pecans in the ingredient list. They just go together. I love to bake my sweet taters in the oven and serve them with fixin's. Thanks so much! oh yums! I have never had a po-boy, but I have heard of their greatness... and your picture is totally compelling. Sadly for me, my otherwise-wonderful boyfriend does not like sweet potatoes at all. So, every time he goes out of town, I celebrate by eating non stop sweet potatoes! Roasted, baked, in tofu scramble, in stew... mmmm! I came across Rum-Spiked Sweet Potatoes with Pomegranate Pecans from 1,000 Vegan Recipes by Robin Robertson...super fabulous! I love shaved sweet potatoes cooked in a maple syrup reduction. I love using sweet potatoes in stuffed chiles/peppers or when I make vegetarian shepherds pie! That's the best.. it's so earthy with some kale in there as well. Mmm. Boring, I know, but I like them roasted in the oven. So simple and yet so good! What a great looking sandwich. Insead of deep frying the sweet potatoes, is there any way they could come out crispy from the oven? If so, what temp would I use? (I still am dealing with high cholesterol which translates to no frying). PS-I just received your "The Complete Guide to Vegan Food Substitutions". What a great read, the possibilities are endless. Thank you!! i love my sweet potatoes anyway really but they are especially good in a curry sauce. I'm pretty anyway goes with my sweeties too, but I love to mashed them up, add a little maple syrup and make a sweet potato quesadilla. Second to that, sweet potato fries. That looks and sounds sooo good! I love all the different layers of flavor. I adore anything with chipotle and sweet potato. I like to bake my sweet potatoes and then eat them with a garnish of black beans, tomatoes, cilantro, onion and cumin. And sometimes I add corn and vegan sour cream for good measure. se puder dá uma passadinha lá : http://avozdafenet.blogspot.com/ , desde já agradeço ,fique c/ Deus ! Who were the two lucky people to get the book?? This recipe is brilliant! I love when people think of cool veggies to sub for meats & fish! Wow, those pictures of Laguna Beach and all were sobering! I hope things will calm down and return to normal. Sweet Potatoes are my favorite! I especially love sweet potato sushi rolls! So very good and delicious. Mmmm. Thanks for sharing this recipe Joni! It looks amazing. As for my favoutite way to eat a sweet potato, I am currently hooked on making an inside-out burrito with a freshly baked potato - I pile on the black beans, salsa, guacamole, green onions, and sour cream and dig in!